"HIGHEST RETURNS TO SHAREHOLDERS OVER THREE YEARS: FINANCIAL SERVICES — RM10 BILLION AND ABOVE MARKET CAPITALISATION: Hong Leong Bank Bhd - Delivering Stellar Returns | The Edge Billion Ringgit Club 2018"
Hong Leong Bank Bhd has emerged as one of the winners in the category of the highest total returns for the years in review. That is not surprising, given that its returns came in at a three-year compound annual growth rate of 14.7% in the award evaluation period of June 30, 2015, to June 29, 2018. Investors who had bought the banking group’s shares three years ago would have seen a price appreciation of about 53.28% and reaped a dividend per share (DPS) of 134 sen between its financial year ended June 30, 2015 (FY2015), and FY2018. The banking group’s share price has continued to climb since June 29, gaining at least 10% to reach RM20.38 at its close on Oct 31. Its DPS increased noticeably from 41 sen in FY2016 to 45 sen in FY2017 and 48 sen in FY2018. The higher FY2018 dividend was in line with the banking group’s higher net profit for the financial year — up 23% year on year to RM2.638 million. Total income for FY2018 grew 6.3% year on year to RM4.84 million, underpinned by prudent loan pricing and funding cost management, coupled with strong growth in non-interest income contribution, says the company in a press release. The banking group also highlighted that its net interest income grew at a healthy pace of 4.2% from a year ago to RM3.5 million, representing a net interest margin of 2.1%. It is worth noting that Hong Leong Bank’s non-interest income grew a substantial 12.5% in FY2018 on the back of strong wealth management income and higher gains from Treasury operations. Apart from playing a significant role in the local banking industry, Hong Leong Bank also has a regional presence in Singapore, Hong Kong, Vietnam and Cambodia. It has a 19% stake in Bank of Chengdu Co Ltd as well, making it the first Malaysian bank to gain a strategic investment in China. The largest segment of Hong Leong Bank’s loan portfolio is mortgages, representing about 45% of the group’s outstanding loans. AmInvestment Bank Research notes in a report that digital and cost management initiatives have resulted in cost savings of RM61 million, or a 3% decline in its total cost base for FY2018. “It has raised the transactional users, volume and amount utilising digital channels for wholesale and retail banking. More functions have been added to its mobile app to increase the stickiness of customers with the group. The group will continue its digital investments to lower its CI ratio,” says the research house. Managing director Domenic Fuda says in the bank’s fourth-quarter performance press release that Malaysian economic growth is expected to remain moderate amid continued support from domestic economic activities and still favourable external demand. He adds that any pullback in business and government investment would be for the short term, and is expected to be offset by a potential boost in private consumption. “Resumption of consumer, business and investor confidence going forward will boost the Malaysian economy,” he adds. Fuda says the bank’s priority is to continue to execute its digital strategy by strengthening its key offerings and transforming its products and services. It will also continue to grow its domestic franchise and regional business by entrenching itself in the communities that it operates in, leveraging its branch footprint and digital capabilities. 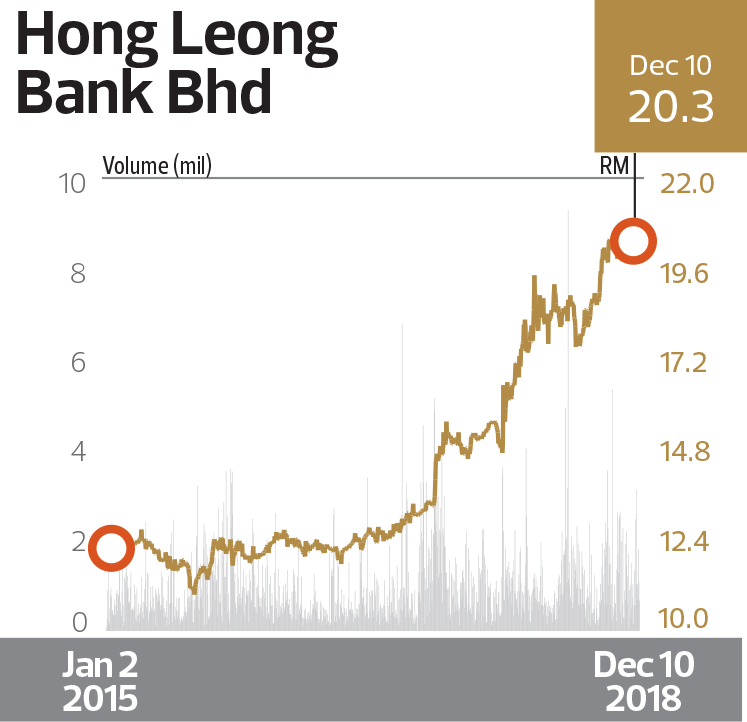 Affin Hwang Research says in a recent report that it is optimistic about Hong Leong Bank in the year ahead, driven by the potential rollout of more business-friendly policies under the new government and a pick-up in business confidence.